There’s a lot that can be said about last year starting with a brisk and healthy real estate environment, an improving economy and serious stock market advances. Closer to home it can be said that 2013 was a good year, 2013 was a big year, and 2013 was a year where California crushed 4.23 million tons of wine grapes and prices held steady. So far, 2014 is looking good too. In Napa and Sonoma Counties, the same goes for the sale of vineyards, vineyard estates and wineries. Buyers are interested. I want to start the season by providing you with a quick rundown of various elements that affect our real estate market. Whether you are a buyer, seller, or holder, this is information that ultimately drives values, pricing and sales. From Healdsburg to Sebastopol to Sonoma in Sonoma County and from Calistoga to St. Helena to Napa in Napa County, buyers are buying. Where are they coming from? Buyers are showing up in the form of locals (within wine country), regional locals (within the Bay Area), and buyers are showing up from across the country and abroad. In short, they’re coming from everywhere! Lifestyle buyers are back in the hunt and they are looking for high end and high quality. They have high expectations. They are looking for everything from a charming weekend escape cottage to an exquisite vineyard estate, from raw land to a boutique winery. So far, we’ve had a limited amount of inventory for this well-heeled clientele. To quickly summarize, there’s demand… we need supply. So if you’re thinking of selling… give me a shout. The stock market continues to simmer (at least at the time of writing) and our local wealth generator is hot as ever. One report shows as many as 45,000 new jobs created in and around Silicon Valley last year. It’s an economy on fire. From San Francisco to San Jose and into the East Bay, tech is sizzling and those in the know believe it is just going to get hotter. From venture capital, angel investing, mergers and acquisitions… the wealth engine is humming. The broader reach of buyers throughout the country and abroad is also benefiting from this economic excitement. Fortunately for us, this demographic likes wine and loves wine country! What about new vineyards: have we over planted as the market has improved? So far, planting new premium vineyards has not outpaced the demand for fine wine. In past cycles this is the time where we would see planting take off and we could prepare for overproduction down the line resulting in lower grape / vineyard prices. In this case, we may actually be looking at real scarcity in premium land for additional vineyards in places like Napa and Sonoma Counties. With challenges such as water, environmental regulations and just plain pragmatic farming practices / returns, finding new ground has become more challenging. We will continue to see older vineyards replanted, incorporating more efficient techniques, additional vines, and disease resistant rootstocks that will likely result in somewhat improved yields on active ground. The net result over time is greater value on plantable land and existing vineyards in fine wine regions such as Napa and Sonoma Counties. Scarcity leads to higher prices. Looking at the larger California market, Allied Grape Growers suggest that there are approximately 645,000 acres planted to vineyard (555,000 bearing and 90,000 non bearing). Not surprisingly the most popular varietal of the nonbearing vineyards is Cabernet Sauvignon, followed by Chardonnay, then Pinot Noir. Red varietals make up 71% of new plantings with the balance in white varietals. Grape prices are up and stable going forward for average to good quality fruit with steady demand. Climbing further up the quality ladder, demand is very strong for ultra premium fruit. For the most part, grape prices increased slightly from 2012 – 2013 according to the preliminary grape crush report. Some high points include $35,000 being paid for a ton of Napa Valley Cabernet while the average price was $5,493 / ton. 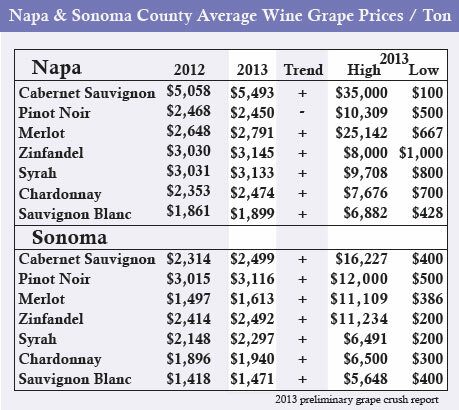 In Sonoma county the highest price paid for Cabernet Sauvignon was $16,227 while the average was $2,499. The next highest price paid in Sonoma County was $12,000 / ton for Pinot Noir while the Sonoma County average was $3,116 / ton. See the chart for more details on some of your favorite varietals. In other positive news, UC Davis is at it again. This time it looks like the UC Davis Foundation Plant Services Department has created a Pierce’s disease resistant grape vine that could be commercially available as early as 2015. These vines could be planted in buffer zones next to wetlands, creeks and riparian areas where the sharpshooter likes to lurk. Our local real estate market has a direct link to the wine business. That shouldn’t be news to most of us, but I find it helpful to keep an eye on what is happening in the wine market as a leading indicator to vineyard, vineyard estate and winery values. Right now, things look quite positive. According to Silicon Valley Bank, fine wine sales ($20 & up) are expected to grow 6 – 10 % in 2014. This is great news for Napa and Sonoma since we’re in the business of growing and selling fine wines. In the super duper extra premium wine segment, sales of wine in the $70+ / bottle market are brisk. Apparently a 29% gain in the broad stock market of 2013 is cause for celebration. On the bulk wine side of things, Brian Clements with Turrentine Grape Brokers was recently noted saying that the bulk wine market is in good shape with stable prices, good supply and demand. Prices have tempered somewhat from 2012 but appear to be in a sustainable range. For example, even after two large harvests, Sonoma County Cabernet Sauvignon went from $10.57 gallon in 2010 to $19.60 / gallon in 2013 (a slight drop from 2012); 2013 Sonoma County Pinot Noir was going for $18.73 / gallon; and Chardonnay was $11.73 / gallon. Break these varietals down to specific Appellations and the prices will fluctuate with premiums paid on Russian River Pinot Noir and or Rutherford Cabernet from the Napa Valley as examples. Fortunately, for smaller wineries, more states are accepting direct shipping. California wineries can now ship to 40 states with Montana and Arkansas recently opening the door. This is important because it allows the winery to capture the full margin of their product rather than being forced to participate in the wholesale market. Reports show that sales of winery to consumer shipments increased 8 – 10% last year. Congrats to those getting paid the full value of their service, talent and product! As a region Napa has the lions share of direct shipping and as a varietal, Pinot Noir is ramping up across the country. The lesson here: improved margins equal more profit and a higher valuation on a winery asset. One thing we do need to keep an eye on is the inroads that imports of foreign bulk wine are making in the lower end wine segments. This is not something that is necessarily competing with Napa and Sonoma at the moment, but worth keeping on the radar. For example, last year 100,000 labels were approved by the Alcohol & Tobacco Tax & Trade Bureau: 21,445 labels were from California with the balance from elsewhere including 26,340 labels from France. The uptick in grape prices, increase in wine sales and bulk wine sales have taken the pressure off vineyard owners and generational winery owners that were struggling through the midst of the great recession. On the real estate front there’s been a very real lack of quality inventory, especially smaller boutique winery properties and high end vineyards / estates. This is not a new story but worth repeating because larger wineries are still looking for expansion through mergers and acquisitions whether through a strategic purchase of a smaller brand / winery facility or an opportunistic synergy with a more developed and dynamic network of vineyards and distribution. It is safe to say many of these transactions are held close to the vest to insure confidence and maintain a bit of mystique. Ahh the romance… never, kiss and tell. We will still see the transfer of properties. Sale scenarios will present opportunities and challenges for the buyer. In some instances a buyer may need to create or rebuild a brand, distribute inventory or infuse new energy into sales and marketing. In another scenario there could be no brand or inventory but the winery entitlements / permit exist, even infrastructure and maybe equipment, or any combination there of. If the buyer has his ultimate vision in mind including the number of cases / gallons produced, type of onsite retail sales (public or by appointment), and the foot print envisioned, I would recommend purchasing a property with entitlements that have already been approved. While starting from scratch with a raw piece of land and adding value going through the entitlement process appears to be a pragmatic approach, I can assure you the journey of obtaining a winery permit from start to finish is a long road filled with uncertainty. On the other hand, wineries that have a successful brand, positive cash-flow, desirable entitlements and improvements are never for sale. While the previous statement is mostly true, there are opportunities that arise in strict confidence and at a premium price. That said, with 3,674 wineries in California alone (7,762 wineries across the country) there may be just one for you. Q – What is considered an old vine zinfandel? Anyone up for a rain dance? It should be no surprise that water tank sales have increased this year with the notable drought. Fortunately, early February brought with it a 5 day downpour with some local areas recording more than 15 inches of rain. While most communities averaged closer to 5 inches, this welcome divergence from an otherwise sunny dry winter helped replenish numerous reservoirs, washed the dust off countless streams and even put a green cover on some local hills. Then the tail end of February ended with another solid dose of rain. While it is likely that these rains won’t end the drought, they sure brought some relief and provided many local farmers a little breathing room for the coming growing season. I’ll keep my fingers crossed for more precipitation over the next couple of months. I don’t see any discounts on vineyards with a good water source. My sense is that we are in a very positive market for wine country real estate. Whether a charming cottage, a modern masterpiece, a premium vineyard, estate or winery, I believe this is a good time to be both a buyer and a seller. Indicators point to a solid yet balanced market within the wine industry that has a direct effect on where we live. The macro economy and Silicon Valley look to keep humming along as well. People from all over the world have a love affair with our region because of its natural beauty and first class quality of life. They also enjoy our wines so it helps to take a look at the ebb and flow of the local factors that drive the real estate market. All this talk about wine is making me thirsty. I’ll leave you with one last thought: without wine, it wouldn’t be called wine country.